I have a lot of stuff in my cabinets (this is not mine, someday I will show you though) … Whenever the stakes are high and I’m trying to prepare my skin for something - an event or something involving photos - I always feel kind of stressed out looking in there. What if I use the wrong combo, break out, use too much to combat a break out and dry out … etc. So I was kind of relieved when, pre-Fashion Week, I received the Somme Institute 5 Step Regimen. I’d seen this line before - I love the packaging - but I never knew much about it. 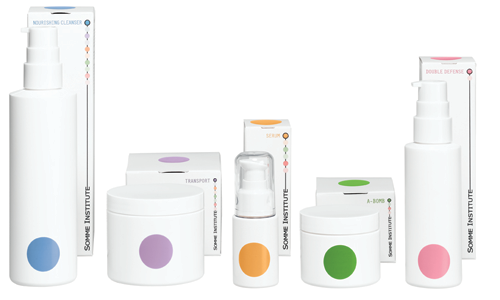 Turns out it was created by a research lab after they ended up patenting their own discovery - MDT5 - which Somme says allows the products to penetrate deeper into the skin to better aid in repairing sun damage, reducing fine lines/wrinkles, and treating/preventing acne/rosacea, all while working to improve skin tone, texture and clarity. The kit came with clinicals (photos and written derm reports) that were really impressive, which helped convince me to up my morning routine from ZERO products to 5, and my night routine from 2 products to 4. AM: Nourishing Cleanser (Cleanses), Transport (Exfoliating Pads), Serum (Vitamin C Treatment), A-Bomb (Moisturizer) and Double Defense SPF 30+ (Sun Protection). PM: Above - except no sunscreen. I actually loved the ritual of it all, and the lemon-y scent of the products. After about five days, I definitely saw an improvement in my overall skintone evenness and clarity. My skin felt plumper too - I think because I was finally moisturizing regularly. I won’t get into all the details but I have a pretty good understanding of the key ingredients of each product just knowing what I know about skincare … they definitely cover all the essentials. Think of it like a multi-vitamin for your beauty routine. If you’re looking to take the guesswork out of your routine, I highly recommend switching to this system if you can afford it - at first blush it looks expensive, but if you do the math on what you’ll save experimenting on creams that don’t work (or work together), it makes sense. Also, it looks so much nicer on your counter than the average stuff!